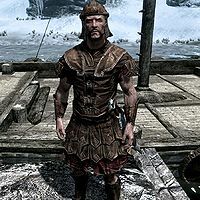 East Empire Mercenaries are the four Nord soldiers found on the ship you take to Japhet's Folly during the quest Rise in the East. After you have helped Orthus Endario by finding information on pirate attacks which have affected the East Empire Company's business, you'll be approached by Adelaisa Vendicci, the captain of the East Empire mercenaries. She will request that you accompany the crew to Japhet's Folly to help defeat the pirates. When you come to the docks for the voyage, one of the East Empire mercenaries may ask you, "You're the one who's coming to Japhet's Folly with us, right? You ready to go?" If you agree, he will shout, "All aboard!" However, if you refuse, he will say impatiently, "Well, hurry it up!" This page was last modified on 3 April 2014, at 23:48.